Summer. We all long for it, but at the same time the majority of us prefer the layers of clothing. I like my sugar, my cheese and my white wine. Yes, I know… not very yogic of me, but I am none the less human. This winter I have noticed my belly region different. Two kids later and the foundation of my workouts not core-related, its softer. I have decided to challenge myself to take 10-15 minutes everyday and follow an abdominal routine for Mandy Ingber’s book, Yogalosophy; for we all know that without a daily commitment (whatever your complaint may be), results are not granted. Here is the routine comprised of 9 postures. Yogi Bycycles : On back, begin with knees hugged to chest and hands behind head. Using abdominal strength, lift your upper body. Extend your right leg and cross your right elbow to the outside of your left knee. Exhale and draw the navel in towards the spine. Switch side to side for 10 reps. Twisted Root Crunches : On back, cross left leg over right and hook left foot behind right ankle. Wrap arms, right elbow under left and wind right hand around left wrist to bring your palms to touch. Turn upper and lower body simultaneously. Do 10 reps, then switch sides and repeat. Lower Belly Lifts : Extend legs up so that feet and hips are in alignment and your body is an “L” shape, with your arms by your sides. Use your lower abs and exhale as you press the feet straight up. The belly should draw in and down. Do 10 reps.
Windshield Wipers : Recline and keep the heels above you, in line with your hips. Extend the arms out to the sides, shoulder level with the palms pressing down into the floor to brace yourself. 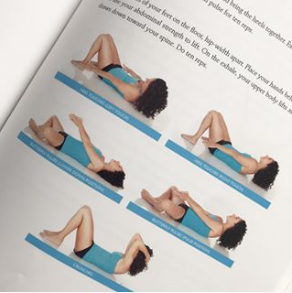 Lower your straight legs halfway to the right, maintaining a connection to the abdominals. Use your ab strength as you bring the legs back and through to the other side. Repeat 10 times. Heel Touches : On back, knees bent, feet hips width apart and press your knees together. Reach down to your right heel and then to your left. Do side to side 10 times. Butterfly Pulses : Allow the knees to open to the sides and bring the soles of your feet together, Extend your arms and with palms together reach forward and pulse for 10 reps.
Crunches : Plant the soles of your feet on the floor, hip width apart. Place your hands behind your head and use your abdominal strength to lift. On the exhale, your upper body lifts as your navel draws down toward your spine. Do 10 reps.
Reclining Splits with Pulses : Extend your legs up and into a “V” shape. Reach your arms between your legs, and with palms together, pulse through for 10 reps.
Scissor Kick : Lift your hips and place your hands underneath you to ensure your lower back is on the floor (there should be no space between your lower back and the floor). Raise your torso up and scissor-kick your legs, one at a time. Do 10 reps.